Confessions of a Liberal Mind: No Politics please, It's the Greatest show on earth! No Politics please, It's the Greatest show on earth! The Rugby world cup final is on Saturday, and it will be live on pay-per view here in Canada. I predicted a France-New Zealand final. France beat New Zealand in a dramatic quarter-final in Cardiff. The Final will be England against South Africa. I was totally wrong with my prediction, and I couldn't be happier in the case of England. Much like my Ontario election prediction, I didn't have high enough expectations for England. My favorite moment of the tournament had to be this drop goal where England put the game out of reach against France. It was a brilliant drive put together by the English forwards, and poise and patience in the drop goal by Jonny Wilkinson (The Beckham of Rugby, except he wins World cups). England came into the game, as gamblers, and they had adopted the Kenny Rogers song of the same name, as their team song! And they gambled against the French big time! 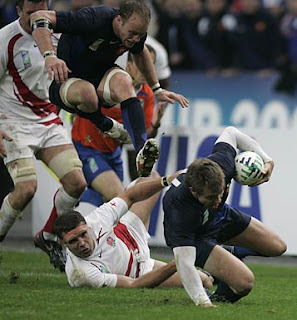 The defining moment of the match in the eyes of the French, was this awesome last second ankle tap tackle by the English Flanker Joe Worsley which saved the game! France never got any closer, and the English pack took control of the game. What put England Over the top against France? This video message from Kenny Rogers. Posted by Jamie Callingham at 8:18 p.m.